Berlin, the 9th of November 2018 – Read our analysis on the EURUSD in this week’s JRC Capital Management Weekly Outlook. Since the beginning of the year, the EURUSD lost almost 6%. Among the main burdening factors for the European currency were the everlasting Brexit uncertainties and the dispute about the Italian household deficit. On the other side, the Greenback functioned as a safe haven during market turmoil. Furthermore, the restrictive monetary policy of the Fed led to higher demand for the Dollar. As expected, the Fed did not raise the interest rates in the last session; the subsequent press conference confirmed the market expectation. Hence, a fourth rate hike within this year seems very likely. The coming trading week contains some important economic data for the EURUSD. On Monday, we expect the ZEW economic survey for the euro zone, an important sentiment index for investors. On Tuesday, the gross domestic product from Germany and the euro zone as well as the consumer price index from the USA will be published and could cause some volatility on the markets. The retail sales from the United States are on the agenda for Thursday. Since the US-labor market looks very robust, the Fed focuses more on consumer data. Five weeks and 500 pips lie between the high of September and the low of October. Consequently, the chart of the EURUSD is quite negative. Even a short recovery in November, which bounced at the 38.20% Fibonacci Retracement, cannot change anything about it. If the price continues to fall, we can locate a strong support area at 1.1300. Already in August, this level caused a change in the market direction. Prices under this level would be the lowest since June 2017. The subsequent support area is situated at 1.1200. Especially between 2015 and 2017, this area served many times as a support or resistance. 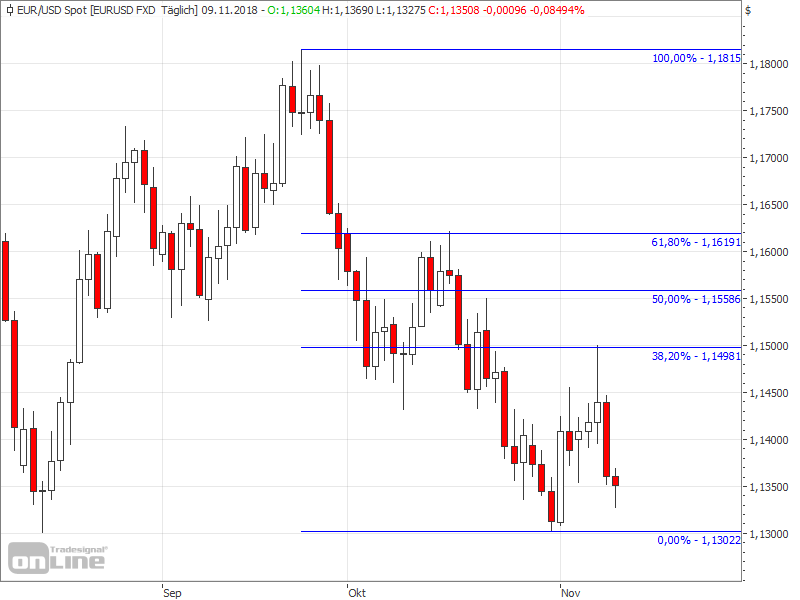 In the case of rising prices in the EURUSD, investors should keep an eye on the Fibonacci levels. During the last upward trend, the course bounced almost exactly at the 38.20% Fibonacci Retracement at 1.1498. The 61.80% Fibonacci Retracement is located at 1.1619 and in combination with a significant of October, this could be an important resistance area.